How does the cell build functional signalling complexes at the plasma membrane? What are the requirements to create a responsive endocytic platform? The principle driving force of our laboratory is to uncover physico-chemical rules that govern local organization of the cell membrane and connect this to cellular and organismal physiology. To study phenomena at the cellular scale, we utilize principles from the physical sciences to frame questions about movement of molecules and organelles inside cells. We have also have developed numerous microscopy tools to study organization of cellular components, from the nanometer scale in specialized domains in cell membranes to the micron scale prevalent in mapping endocytic pathways. We study sorting properties and endocytic pathways of a variety of molecules, including membrane proteins, lipids and lipid-tethered proteins in vivo. Our studies provide a compelling picture of the cell membrane as an active composite of the lipid bilayer and a dynamic cortical actin layer beneath, wherein, dynamic actin filaments help in controlling the local composition of membranes, and shaping endocytic trafficking. 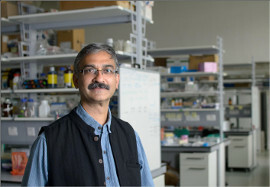 The trajectory of this work has led us to explore the fine structure of the plasma membrane, providing for the first time an in vivo picture of lipidic assemblies providing a new understanding of how membrane rafts may be created, an understanding of the role of specialized endocytic mechanisms for the establishment of developmental gradients and the regulation of membrane tension.